Get 75% off more than 300 courses with Udemy (using coupon code GIZMODOSAVE75, one of the largest marketplaces for teaching and learning. 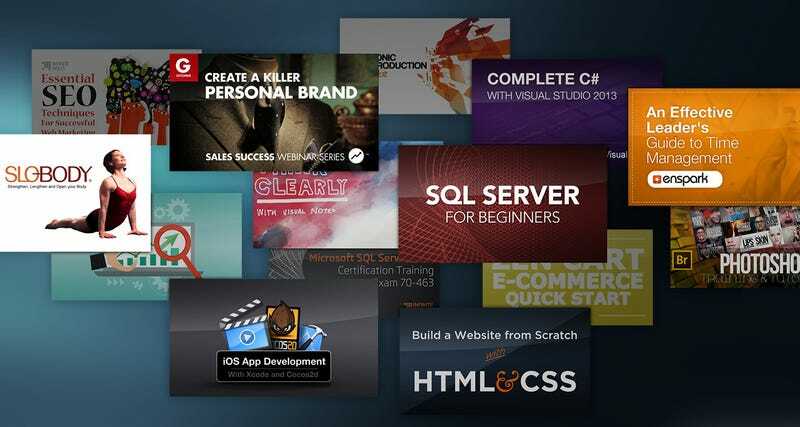 Udemy features over 10,000 expert instructors in courses ranging from guitar to photography to web development, and all are on-demand and available 24/7 via phone, tablet, or web. Courses at Udemy help to foster new skills for a career change or a growing interest, or to simply refine and improve existing talents. Highlighted below are four courses, but you can find hundreds of others at 75% off using code GIZMODOSAVE75. Want to see all the courses? Click to enroll in hundreds of other courses at 75% off using code GIZMODOSAVE75. Terms and Conditions: Coupon code is not valid with any other promotional offer or discount and is valid until 9/20/14 11:59 PDT. One coupon code use only per purchase. Coupon code requires a Udemy account, and is subject to terms and conditions found here. Udemy reserves the right to cancel the coupon code at any time. Coupon code is not exchangeable for cash. Coupon code is not valid with purchases made on the Udemy iPhone, iPad or Android app. Some courses do not apply. If you return your purchase, you will be refunded the amount paid. Offer good while supplies last.